BAD!SLAM!NO!BISCUIT! is the Poetry Slam, that means you get 2 minutes on stage with no props or music with your original material for prizes! 1st prizes! BAD!SLAM!NO!BISCUIT! is the Poetry Slam, that means you the audience with your yelling arms, your yelling legs, your yelling heads, all for victory! 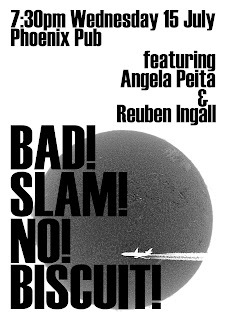 And this month it is open season on the Australian Poetry Slam, which means BAD!SLAM!NO!BISCUIT! is the heat one for the Australian Poetry Slam, yes, who will go through as victors to face more victors in a battle to decide who will be more victors, yes victors!? And filling the Hadley Memorial Slots is Canberra's answer to William Shatner! The Flying V (aka Vermilion Sands aka Varisht Gosain). 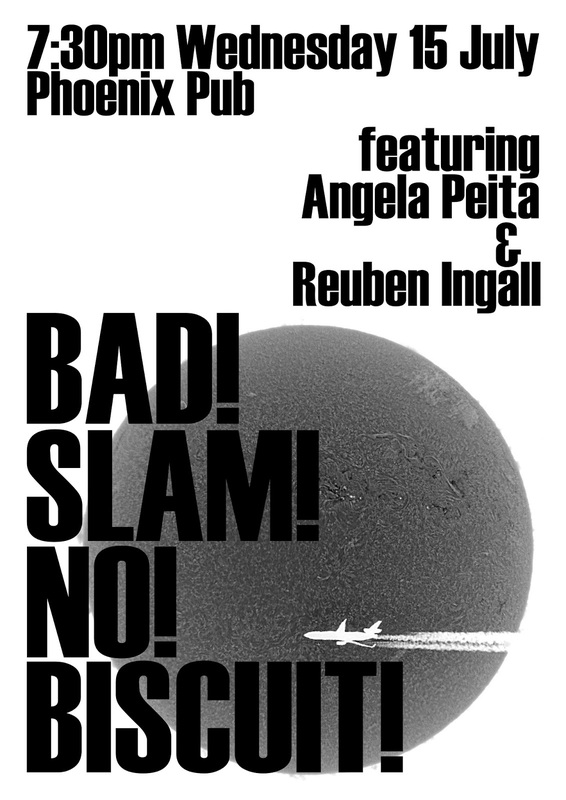 So join BAD!SLAM!NO!BISCUIT! for poetry! Sign-up from 7:30pm or when the Score Adder says sign-up! Poetry slam at 8pm! It all ends at 11:30pm! And remember: no props, no music, your original material, victory, defeat, wear shoes.